CHARLESTON, South Carolina, June 28, 2011 (ENS) – Two public-private initiatives were launched Tuesday to reduce emissions from short-haul trucks that shuttle goods between ports, warehouses and local stores by replacing older vehicles with newer, cleaner ones. The U.S. EPA, the Coalition for Responsible Transportation and the Environmental Defense Fund jointly introduced one initiative to reduce harmful diesel emissions from thousands of large diesel drayage trucks. 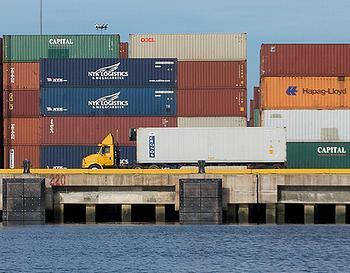 The announcement came at a press conference at the Port of Charleston, South Carolina. “EPA’s SmartWay dray truck initiative will help ports contribute to their local economies, while protecting the air quality, environment and public health of nearby communities,” said Gina McCarthy, assistant administrator for EPA’s Office of Air and Radiation. “This program offers great incentives for independent owner operators and trucking companies to replace their older drayage trucks with cleaner, less polluting models,” said Marcia Aronoff, senior vice president for programs at Environmental Defense Fund. “With the rise in population and the growth of the freight transportation industry, we must be vigilant, forward thinking and creative in finding solutions that reduce toxic emissions and embrace market-based sustainability efforts,” said Aronoff. The SmartWay Drayage Program is based on the successful SmartWay Transport Partnership, a collaboration between the EPA and goods movement stakeholders, which provides a framework to assess transportation-related emissions and energy efficiency, and recognize superior environmental performance. Many of the dray trucks today are older and dirtier than trucks used on highways, and they contribute to serious public health and environmental problems at ports and surrounding areas. Model year 1994 and older dray trucks emit about 60 times more fine particle (PM 2.5) emissions than model year 2007 and newer trucks. This fine particle pollution is linked to premature deaths, heart attacks, childhood asthma and increased emergency room and hospital visits. The EPA has developed an emissions calculator to help port truck carriers measure their paticulate matter, nitrogen oxides, and carbon dioxide; identify strategies to reduce harmful diesel emissions and track emissions performance on an annual basis. Under the SmartWay dray truck initiative, drayage carrier partners sign a partnership agreement and commit to track emissions, replace older dirtier trucks with cleaner, newer ones, and achieve at least a 50 percent reduction in PM and 25 percent reduction in NOx, below the industry average, within three years. 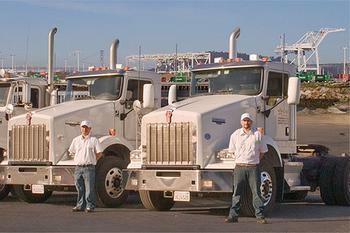 For the drayage carriers, the agreement is good for business. Shippers who are already members of EPA’s SmartWay commit to ship 75 percent of their port cargo with SmartWay dray carriers within three years. Shipper partners are already giving business priority to SmartWay drayage carriers. Some of the country’s largest shippers have become charter shipper partners in the program – Best Buy, The Home Depot, Hewlett Packard, JC Penney, Lowe’s, Nike, Target, and Walmart. CRT is a national coalition of importers, exporters, trucking companies and ocean carriers who share the belief that by partnering together, ports and their customers can improve the environmental quality of port communities while ensuring that the ports remain an engine for job creation and a thriving economy. “This partnership will generate private sector investment in clean technology, improve the environmental quality of our nation’s port communities and demonstrate the commitment we have made as the shipping industry’s leaders to emissions reductions,” said Gabrielson. In addition to the financial support provided to trucking companies and owner operators by participating retailers, today’s press conference highlighted a variety of U.S. EPA, state, regional and local programs that provide low interest loans and down payment assistance for transitioning to clean port trucks. The port trucking carrier partners are: California Cartage Express, California Multimodal, Container Connection; Evans Delivery Company, GSC Logistics, PDS Trucking, Performance Team/GaleTriangle, Total Transportation Services, and Western Ports Transportation. In addition, four Mid-Atlantic States announced today that they are teaming up to offer a generous program aimed at replacing old, polluting drayage trucks. Led by the University of Maryland and the Mid-Atlantic Regional Air Management Association, the new program seeks to double the impact of a federal cash-for-clunkers-style program with public and voluntary private contributions. The Mid-Atlantic Dray Truck Replacement Program will offer $15,000 to short-haul truckers to cover the down-payment on a new vehicle. The program is also helping arrange financing for the truckers. Over the next two years, it could replace hundreds of the most polluting delivery trucks in the region. The Ports of Virginia, Baltimore, Wilmington and Philadelphia, with support from their states, are chipping in to add dollars to a $3.3 million base grant from the U.S. EPA. All together, the program will match the EPA support dollar-for-dollar with a combination of public and private money. Already, the organizers have lined up more than $400,000 in public support. More is pending, and they are expecting financial commitments from the industry as well. In the first year, Throwe hopes to raise approximately $1.5 million in public and private money to extend the impact of the EPA grant. In a separate program, the board of commissioners for the Port Authority of New York and New Jersey on May 31 expanded eligibility of older drayage trucks that can be replaced under its Truck Replacement Program to include trucks with model year engines 2003 or older. The Port Authority has received $8.57 million in grant funding to assist with implementation of the program. Under the drayage carrier agreement and through incentives, EPA and its partners expect to build on the existing SmartWay program’s success in cutting fuel costs, reducing harmful diesel emissions, preserving jobs, and protecting air quality. Since 2004, SmartWay partners including many of the country’s top retailers, trucking and rail companies and manufacturers, have reduced fuel use, cut foreign oil imports by 50 million barrels and saved an estimated $6.1 billion in fuel costs.